Alex Weber, 18, has just published a study that analyzes how these balls enter and degrade in the water. Alex Weber's favorite thing to do is free-dive off the coast of Carmel, California. She has been doing it since she was a child, accompanied by her father, exploring the underwater coves, fissures, and giant kelp forests. She is able to hold her breath for 2 minutes at a time and her dad for up to five. But her perspective changed abruptly in summer 2016 when, at age 16, she and her dad were diving in the waters near Pebble Beach Golf Course. There, she noticed that the sea floor was carpeted in golf balls at various stages of decomposition. Thus began her determined quest to clean up the golf balls and research the issue further. 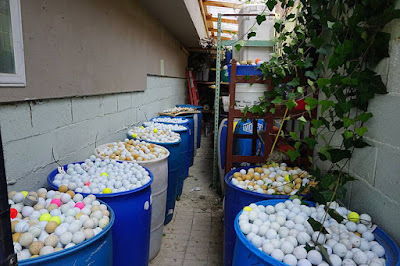 She collected 2,000 golf balls on that first day and, since then, has gathered more than 50,000 in total, a whopping 2.5 tons of marine waste stored in her parents' garage. She's doing more than cleaning, though; she has also been collecting data. Early on, Weber reached out to Matthew Savoca, a Stanford University scientist who studies plastic ocean waste. As Weber explains on her website, she wanted to ask him about the "strong mysterious odor" that the golf balls gave off and wondered if it might be dimethyl sulfide, a plastic chemical that acts as a food trigger for animals. Savoca's curiosity was piqued and he encouraged Weber write a scientific paper about her discovery. He joined her on the collection dives and describes hauling up so many bags of balls that the kayaks they'd brought with them were overloaded and had to be towed back to shore. He told NPR, "When we were out there, we'd hear, 'plink, plink,' and we'd look up on the hill and there'd be golf balls flying in off the course right into the ocean where we were doing collections." They collected between 500 and 5,000 balls per day. "The team notes that golf balls are coated with a thin polyurethane shell that degrades over time. They also contain zinc compounds that are toxic... The surf and currents act like a rock grinder and break down the golf balls. While chemicals from 50,000 or so golf balls will have only a small effect on the ocean, Savoca says they do degrade into microplastic pieces that marine animals could eat. The team also notes that there are lots of coastal golf courses around the world, so this may go beyond California." The numbers paint a grim picture. 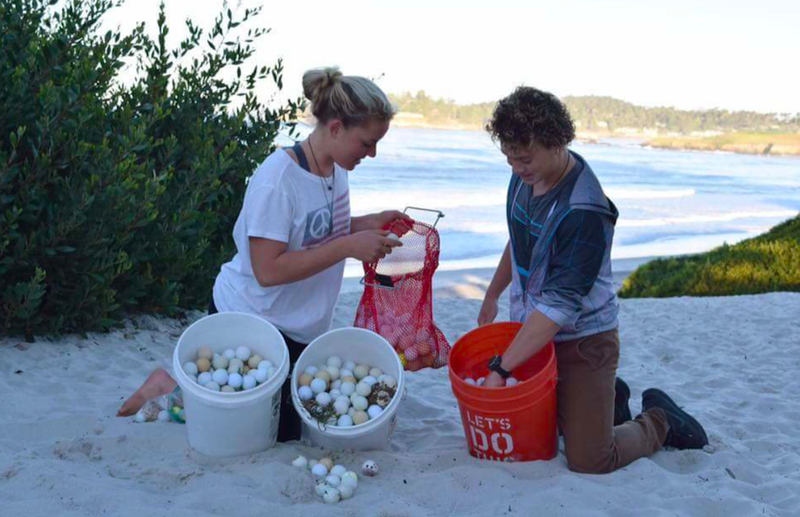 If a player at Pebble Beach loses 1-3 balls per round and the golf course hosts 62,000 rounds of golf each year, then anywhere between 62,000 and 186,000 balls are entering the ocean annually. Multiply that by the 34,011 eighteen-hole golf courses worldwide that are located near oceans and rivers, and it's a real problem. The study authors hope that their work will help create better cleanup protocols for coastal regions with golf courses, as well as tighter regulations for recovering the golf balls. Weber told TreeHugger via email that some golf courses have begun to do beach cleanups and that "we are working to help them expand into underwater collections." Perhaps someone should start inventing an all-natural, water-soluble golf ball, too? Or what about a floating golf ball? Then golfers would have to see what they're doing and it would cease to be acceptable. Learn more on Alex Weber's website, The Plastic Pick-Up.